Western blot analysis of extracts from 293T cells, either wild type (+/+) or G3BP1 knockout (-/-), using G3BP1 Antibody (upper) and β-Actin (D6A8) Rabbit mAb #8457 (lower). 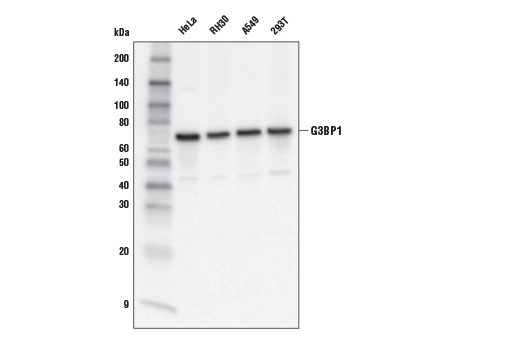 Western blot analysis of extracts from various cell lines using G3BP1 Antibody. Confocal immunofluorescent analysis of HeLa cells, serum-starved (left) or serum-starved and then treated with sodium arsenite (500 μM, 30 min; right), using G3BP1 Antibody (green). Actin filaments were labeled with DyLight™ 554 Phalloidin #13054 (red). Samples were mounted in ProLong® Gold Antifade Reagent with DAPI #8961 (blue). 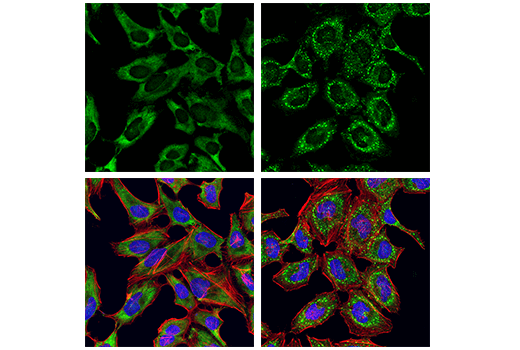 G3BP1 Antibody recognizes endogenous levels of total G3BP1 protein. 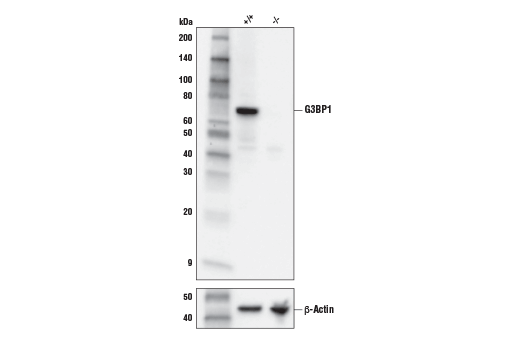 This antibody does not cross-react with G3BP2 protein. Polyclonal antibodies are produced by immunizing animals with a synthetic peptide corresponding to residues surrounding Val218 of human G3BP1 protein. Antibodies are purified by protein A and peptide affinity chromatography. Ras GTPase-activating protein-binding protein 1, also known as GAP SH3 domain-binding protein 1 (G3BP1), was identified as a protein that interacts with the SH3 domain of Ras GTPase-activating protein (RasGap) (1). G3BP1 is involved in the regulation of multiple cellular processes, including mRNA decay and inhibition of translation initiation (2). Furthermore, G3BP1 is essential for the assembly of stress granules (SGs) and functions as an SG-nucleating protein (3). Research studies show that arginine demethylation of G3BP1 promotes SG assembly during oxidative stress (4). Parker, F. et al. (1996) Mol Cell Biol 16, 2561-9. Fischer-Kešo, R. et al. (2014) Mol Cell Biol 34, 4244-56. Kedersha, N. et al. (2016) J Cell Biol 212, 845-60. Tsai, W.C. et al. (2016) J Biol Chem 291, 22671-85.